The Time for Long Term Planning:NOW | Assurance Partners Ltd.
We won’t admit it but NOW is the time to start planning for our long term care needs. Planning ahead is important because 70% of people turning age 65 can expect to use some form of long-term care during their lifetime. 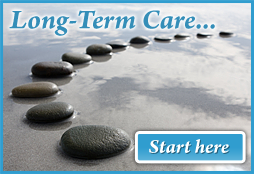 The older you get, the greater the chance that you will need long term care. It’s important to plan ahead because the cost of services often exceeds what you can afford to pay from your income and other investments. With long term care insurance, there is a far greater likelihood that you will be able to leave an estate to your heirs and remain in your home, if desired. Reduce the emotional and financial stress on you and your family and enjoy your retirement in the certainty that you will always be taken care of. Don’t Delay. Call a caring, qualified agent today.